Sumeja Tulic is a writer and photographer based in Sarajevo. She was involved in founding Kriterion Sarajevo, Bosnia’s first collectively-run art house cinema. You can read more of her writing here. 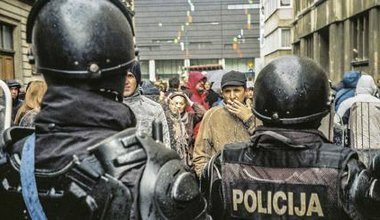 In the Bosnian protests of the last months, the global scenario of police brutality has been re-enacted, with local specifics. And the violence of the police is itself a symptom of the failure of the current Bosnian political order. On the fifth day of ongoing demonstrations in Sarajevo, a routine is establishing itself and there is a feeling of something new in the landscape of Dayton-constitution Bosnian purgatory – citizens are breaking up with their fears.